A study was published last week on the DNA of Helicobacter pylori, the pathogen extracted from the stomach of Ötzi, the ice mummy who has provided valuable information on the life of Homo Sapiens. New research at the European Academy of Bolzano/Bozen (EURAC) further clarifies the genetic history of man who lived in the Eastern Alps over 5,300 years ago. In 2012 a complete analysis of the Y chromosome (transmitted from fathers to their sons) showed that Ötzi's paternal genetic line is still present in modern-day populations. In contrast, studies of mitochondrial DNA (transmitted solely via the mother to her offspring) left many questions still open. To clarify whether the genetic maternal line of the Iceman, who lived in the eastern Alps over 5,300 years ago, has left its mark in current populations, researchers at the European Academy of Bolzano/Bozen (EURAC) have now compared his mitochondrial DNA with 1,077 modern samples. The study concluded that the Iceman's maternal line—named K1f—is now extinct. A second part of the study, a comparison of genetic data of the mummy with data from other European Neolithic samples, provided information regarding the origin of K1f: researchers postulate that the mitochondrial lineage of the Iceman originated locally in the Alps, in a population that did not grow demographically. The study, which also clarifies Ötzi's genetic history in the context of European demographic changes from Neolithic times onwards, was published in Scientific Reports, an open access journal of the Nature group. "The mummy's mitochondrial DNA was the first to be analysed, in 1994." says Valentina Coia, a biologist at EURAC and first author of the study. "It was relatively easy to analyse and—along with the Y chromosome—allows us to go back in time, telling us about the genetic history of an individual. Despite this, the genetic relationship between the Iceman's maternal lineage and lineages found in modern populations was not yet clear." The most recent study regarding the analysis of Ötzi's complete mitochondrial DNA, conducted in 2008 by other research teams showed that the Iceman's maternal lineage—named K1f—was no longer traceable in modern populations. The study did not make clear, however, whether this was due to an insufficient number of comparison samples or whether K1f was indeed extinct. Valentina Coia explains further: "The first hypothesis could not be ruled out given that the study considered only 85 modern comparison samples from the K1 lineage—the genetic lineage that also includes that of Ötzi—which comprised few samples from Europe and especially none from the eastern Alps, which are home to populations that presumably have a genetic continuity with the Iceman. To test the two hypotheses, we needed to compare Ötzi's mitochondrial DNA with a larger number of modern samples." The EURAC research team, in collaboration with the Sapienza University of Rome and the University of Santiago de Compostela, thus compared the mitochondrial DNA of the Iceman with that from 1,077 individuals belonging to the K1 lineage, of which 42 samples originated from the eastern Alps and were for the first time analysed in this study. 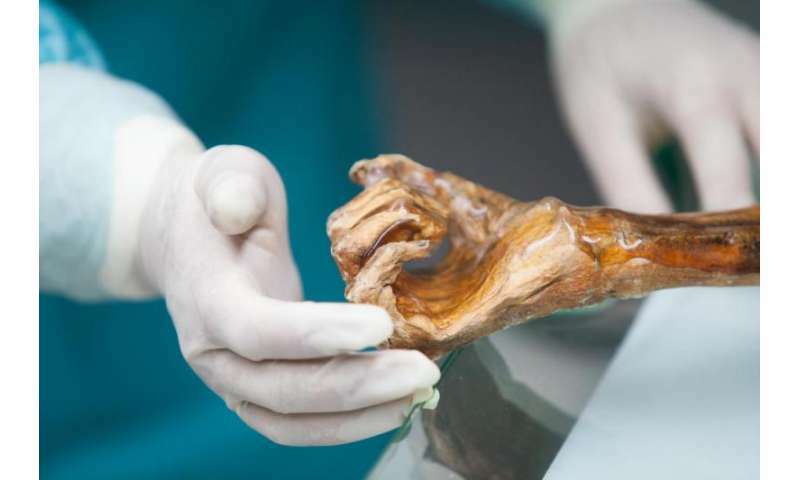 The new comparison showed that neither the Iceman's lineage nor any other evolutionarily close lineages are present in modern populations: the researchers therefore lean towards the hypothesis that Ötzi's maternal genetic branch has died out. Ötzi's paternal lineage, G2a, is part of an ancient genetic substrate that arrived in Europe from the Near East with the migrations of the first Neolithic peoples some 8,000 years ago. Additional migrations and other demographic events occurring after the Neolithic Age in Europe then partially replaced G2a with other lineages, except in geographically isolated areas such as Sardinia. In contrast, the Iceman's maternal branch originated locally in the eastern Alps at least 5,300 years ago. The same migrations that have replaced only in part his paternal lineage caused the extinction of his maternal lineage that was inherited in a small and demographic stationary population. The groups from the eastern Alps in fact significantly increased in size only from the Bronze Age onwards, as evidenced by archaeological studies conducted in the territory inhabited by the Iceman. Based on the history and traditional roles that women have played in cultures ancient and modern, and considering also the mobility of the male, it doesn't see so surprising that specific maternal lines are more apt to disappear over time than the Y connection.